The Finance Wonk: Is the housing market different now? Critical economics and market analysis. Is the housing market different now? If you read the mass media (including an article in the wall street journal this morning [subscription required] http://online.wsj.com/article/SB114895332408765945.html?mod=todays_us_page_one ) you might think the sky is falling and we’re about to see depression-style soup lines feeding the huge numbers of people who will lose their home to “repossession piranhas” peddling deceiving deals to those who can’t afford to pay growing adjustable mortgage bills. Some of the numbers and charts that show up in these stories can be quite dramatic and the potential market impact of a massive real estate collapse is big enough that I decided to see what data I could find. I think you’ll be mildly reassured by my conclusions. First things first: I hope you refinanced in 2003 at a fixed rate, in which case you are probably sitting on a nice sub-6% loan that you will never want to pay off because the rate is lower than many bonds you can buy and the interest is tax deductible. If you find yourself caught in an overdue situation, however, don’t sign anything without reading it and don’t sign anything based on verbal assurances – these simple steps will keep you out of 99.9% of the real estate scams that dominate the press. These guys must be really smooth talkers considering the stories told in the press of individuals signing over their house, with $100,000 in equity, in return for only verbal assurances they would be able to stay renting and get the house back in a year. Reminds me of a used car salesman I once encountered. The Mortgage Banking Association http://www.mbaa.org/ does a regular survey of over 600 members covering 41 million mortgages to track default rates on mortgages. The recent increase in federal interest rates (to 5% May 10th from a low of 1% June 25th 2003 http://www.federalreserve.gov/fomc/fundsrate.htm ) has raised interest rates on mortgages by about 1-2% and, somewhat predictably, has increased the rate of mortgage delinquencies. The real question is how much impact we should expect this to have on the economy. Let’s dig into the data on overdue mortgages. The plot below is a modified version of the one from the Wall Street Journal article. The blue line is the percent of mortgages overdue, and the red line I’ve added is the federal funds overnight rate (the fed rate). Plot of overdue mortgages (blue line and left axis) and FOMC interest rate (red line, numbers not shown). The decrease in fed rates led to a decrease in overdue mortgages, and the currently rising rates are allowing mortgage rates to increase again. It is worth noting that current overdue mortgage percentages are higher than during the 90s even though rates are still fairly low. The first thing that one sees is the shrinking delinquency rates as the fed lowered rates. This is simple to understand as people gained the option of refinancing mortgages at lower rates and lowering their payments while getting money out. The skyrocketing delinquency rates in 2000 can be understood as hardship caused when people lost large amounts of money in the tech collapse. The characteristic of the plot above that concerns me is that the current delinquent rate is above the rate for the entire left half of the chart despite the relatively low fed rates. Is it possible that the housing market is different now? In 2005 some estimates by UBS analysts suggested that up to 40% of loans over $360,000 were closing as “exotic” mortgages with adjustable rates or negative amortization ( http://www.msnbc.msn.com/id/8574006/ ). Could it be that we are about to see a huge increase in the rate of housing defaults as these exotic mortgages catch up with their owners? Or is this a case of misleading chartage – these plots only go back as far as the 90s boom stock market after all. As Mark Twain said: “There are lies, damn lies, and statistics.” I find it suspicious that the charts in all the mass media articles went back to about the same time in 1995. Once I started looking into things I found the picture to be even more complex. Data before 1995 seems to be fairly fractured. This Wharton review on predicting mortgage default was written in 1999 and is asking some of the same questions we are asking now. ( http://www.dcpress.com/jmb/wharton.htm ). Eventually I was able to find data indicating that defaults (different from the chart of overdue mortgages above, but correlated) seem to follow a cycle similar to the stock market but largely inverted. The data is fractured and not easy to chart (some of it is regional, some is by loan segments or size, and it has different sources that don’t agree perfectly). However there is a large peak in mortgage defaults right around 1990 that shows as a delayed jump after the late 80s market drop, much as the 2000 market drop shows up in 01-02 above. The conclusion from this data would be that defaults are a lagging result of economic activity, impacted by interest rates. This seems like a reasonable way to ask yourself what default rates to expect: how well off are people and how much do the mortgages cost? Current default rates are within historical ranges and are appropriate for a market that is neither a runaway bull market nor a collapsed bear market. What does this view ported for the market? Mortgage costs will be rising, reducing the amount of money sloshing around in the consumer’s pockets. (http://financewonk.blogspot.com/2006/04/will-debt-zombies-or-retiring-boomers.html ) This amount can be more than replaced by the current rate of wage increases (http://financewonk.blogspot.com/2006/04/making-my-call-on-economy-for-day.html ), however the consumer will feel less confident with more money going out to cover housing, even if they can afford it. 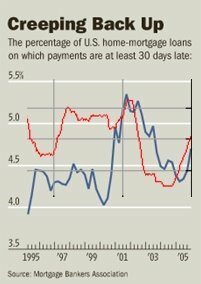 Scenario: Rising mortgage costs drain money from the consumer. It is replaced by wage growth but consumer sentiment goes down. Outcome: Corporate profits go up, but not as much as rosy projections. Negative sentiment will also moderate growth. Market stumbles along susceptible to negative news. Overall I would say there is no fundamental reason for the market to collapse, but profit growth rates will probably decline a bit due to money being diverted into mortgage payments and the effects on sentiment may make the market very wobbly. I would not be surprised to see a mild bear market in the next year or two but there is nothing fundamental about the current situation that would cause us to relive the Japanese real estate disaster. Holding some money in reserve may be a good idea, but I think any bear market would be a chance for the market to build a nice value foundation and I wouldn’t want to sit out of the market for too long. Melchiorre, Camillo T., "A new weapon in default servicing," Mortgage Banking, Vol. 55, pp. 26 - 33, 1995. Nadler, James, "Mapping default zones," Mortgage Banking, Vol. 54, pp. 127 - 134, 1993. Click back to the main page! Finance Wonk = Wall Street Journal psychic? More than three thousand visitors!